Rambler, developed by and Tiago Martins and me is a critical take on near obsessive microblogging habits and elicits reflection on the personal nature, amount and usefulness of information generated every day through blogging and social platforms such as Twitter. Rambler is a critical embodiment of the (until now) metaphorical notion of blogging every step you take. It aims to bring the practice of microblogging to one of many possible extremes, turning it into an automatic, thoughtless act of diffusing large amounts of slightly ambiguous, repetitive and arguably useless personal information. Manifesting itself physically as a pair of sneakers, it mirrors the contemporary, easy going philosophy of the most popular microblogging platform of the moment: Twitter. This project presents a pair of trendy sneakers that take microblogging one step further, by literally posting your steps on a Twitter account. Messages are comprised of repetitions of the word "tap" and the period punctuation mark, symbolizing the wearer's steps and time in between these, respectively. A sensor on the sole of the shoe measures the amount of pressure exerted by the wearer's foot. This information is read and processed by a microcontroller, which transmits it wirelessly via a Bluetooth module with a Serial Port Profile. This three-part setup is powered by two AAA batteries lasting up to 9 hours of continuous usage. A pressure sensor, microcontroller, Bluetooth module, and batteries are all embedded into the sneaker. Their combined weight isn't noticeable in comparison with the sneaker's own weight, and their location is chosen as not to cause discomfort to the wearer. 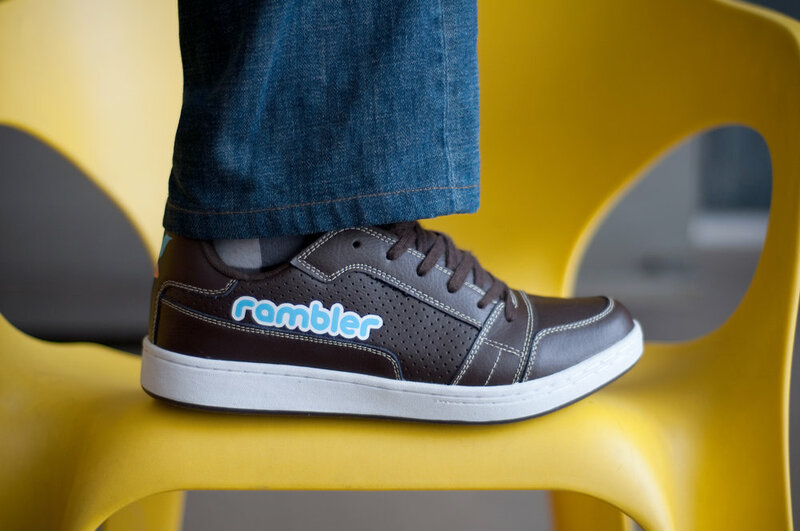 The name Rambler was chosen for the double meaning of the word "ramble." On the one hand, to ramble is to take a pleasant, even aimless walk; on the other, it is also to digress when talking, losing clarity or even turning aside of the main subject. 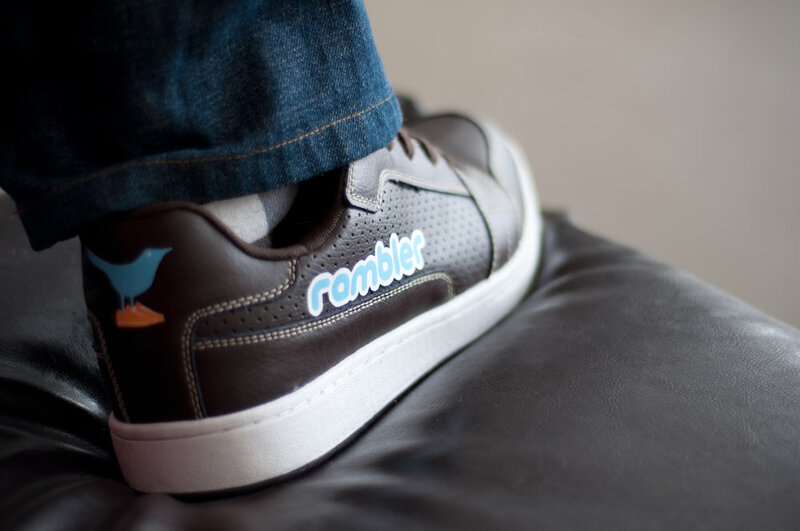 While the first meaning relates to the usage of the Rambler sneakers as footwear (literally as shoes for rambling), the second meaning refers to the desultory usage of microblogging platforms – with a focus on Twitter – into which this project elicits a critical view.